There’s no better way to celebrate a new life – and a new mom – than by throwing a baby shower. These time-honored traditions help families acquire everything they need to welcome their bundles of joy and are a great “last hurrah” before entering the hectic stage of having a newborn. One of the main purposes of baby showers is to “shower” the expectant mother with all the tools and items she’ll need to take care of her new child. As such, you should always arrive with a gift in tow. Shower hosts often create gift registries for their guests of honor, and it’s appreciated when guests stick to these suggestions. Registries are typically baby-focused, however, and it is nice to bring a little something that’s only for Mom. After all, she’s been carrying a baby for the past nine months – she deserves a treat! Flowers are an excellent way to send a message of love and congratulations and infuse the guest of honor’s home with some bright, natural cheer. 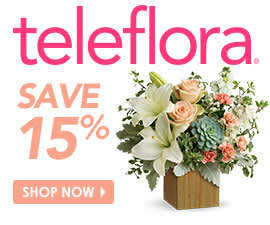 Choose from Teleflora’s New Baby flowers collection the next time you’re searching for the perfect shower present. Baby showers have traditionally been women-only affairs, but many modern moms are changing up this custom and including their male spouses, friends, and family members in the celebrations. Not all showers have embraced the co-ed invite list, however, so don’t bring a male guest unless the invitation indicates it’s alright. It’s easy to get carried away when planning a party, especially when you’re over the moon about the pregnancy of a friend or family member. To avoid going overboard, keep in mind that the day is about celebrating motherhood, and the desires of the mom (and baby) of honor should be respected. Avoid serving too many foods – like sushi, alcohol and certain cheeses – that pregnant women avoid, and keep the decor in line with the theme. New baby flowers are a gorgeous and easy way to enhance the party space. Shower games can be a polarizing issue – some people love their ability to spark friendly competition and keep conversations going, while others would rather just mingle and chat at their leisure. Before planning any activities, get a feel for which side of the debate the mom-to-be is on. If she’s on the fence, look into non-traditional games that can break the ice without bringing down the mood. These are only a few tips on baby shower etiquette for guests and hosts. Just remember to keep the new mom and baby in mind the entire time. It’s a party all about them!